Test Connections - September 2018 - Newsletter | Marvin Test Solutions, Inc.
September 2018 - NewsletterFocus OnSolution SpotlightProduct HighlightIn the NewsDid You Know? Welcome to our 3rd quarter newsletter for 2018. In this issue you’ll learn about MTS’ dynamic 30-year history serving military, aerospace, and manufacturing organizations, an innovative and fielded test solution for Metal Oxide (MOX) gas sensors, and our deployed suite of test solutions that support mission-critical armament systems from the flightline to the depot worldwide. Our trade show schedule for the balance of the year has a global reach, featuring events across the USA as well as Europe and the Middle East. Please join us at one of these events; bring us your most demanding test challenges and learn how we can make test easy for you. 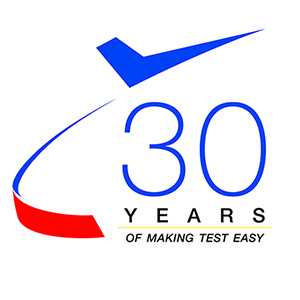 Marvin Test Solutions is marking its 30th anniversary in the aerospace test and measurement industry, providing innovative, feature-rich solutions that make test easy. As we look to the next 30 years, our customers can count on us for test solutions that meet and exceed their requirements, with unrivaled long-term support. The application of MEMS technology has allowed Metal-Oxide (MOX) Gas Sensors to be mass-produced at the wafer level, achieving cost reduction and scalability to large volumes. A PXI-based tester based on off-the-shelf hardware and software provided the optimal solution, achieving high throughput at a moderate cost. Marvin Test Solutions offers robust, rugged, and proven solutions, delivering impressive test capabilities and facilitating troubleshooting across all maintenance levels to meet all current and next-generation aircraft and munitions test requirements. Since its founding as Geotest, Inc. in 1988, the company's singular focus has been to Make Test Easy for automated functional test customers by creating innovative solutions with unrivaled long-term support. With three decades of hardware, software and system design expertise, MTS has been at the forefront of the latest technology advances, providing ATE (Automated Test Equipment) hardware, software, and integrated test solutions that combine quality, performance, reduced footprint, and ease of use, while meeting and exceeding the demanding test requirements of today’s complex military, aerospace, and manufacturing environments. Early integration projects included an environmental monitoring system for NASA’s Spacecraft Assembly Building at JPL, and a test system for water heaters to calculate the products’ annual energy consumption. ATEasy, the company's flagship software product and the test industry's most advanced test development and test executive suite was introduced in 1991 and many high-performance PC-based test instruments followed starting in 1992. The founders of Geotest (Figure 1) recognized both the emergence of PC-based instruments as the ideal future test platform, and the advantages of a modular approach to designing test solutions. This commitment to industry standard modular architectures led to early active participation in the PXI Systems Alliance (PXISA), of which Loofie Gutterman (MTS’ President) is currently the president. By 2004, Geotest’s PXI portfolio exceeded 100 products (Figure 2). Today, the company’s GENASYS mixed-signal test platform (Figure 3) and suite of semiconductor test solutions (Figure 4) bring the advantages of the flexible, scalable, PXI architecture to leading-edge test applications for mission-critical, high-value products from sensors to vehicles, aircraft to satellites. In addition to modular instrumentation products, Geotest developed an expertise in the field of military and aerospace test that today enables the design of the most advanced weapons system test sets on the market, from the field/flightline to the depot. The first PC-based flightline armament tester for Hellfire Missile support was introduced in 1992 and was deployed worldwide by the U.S. Army by the mid 1990's, and the first depot-level test set was based on modular architecture and was first deployed in 1994. After acquisition by The Marvin Group (which now includes Marvin Engineering Company, Marvin Land Systems, and Flyer Defense) in 1997, Geotest was initially named Geotest-Marvin Test Systems and eventually renamed in 2013 as Marvin Test Solutions (MTS). As a member of The Marvin Group, an award-winning military & aerospace group with more than 55 years of experience in the defense and commercial aerospace industries, Marvin Test Solutions has test systems deployed worldwide in support of most major military aircraft and munitions in use around the world. Today, MTS continues to be actively involved in the development and delivery of advanced armament test solutions including products for the PATS-70A and BAT (Bomber Armament Tester) programs as well as providing state of the art flightline test solutions based on the MTS-3060 SmartCan™. Marvin Engineering Company (MEC) is the managing partner for the production of the lion's share of F-35 Alternate Mission Equipment (AME) to Lockheed Martin Aeronautics. This AME includes most of the external stores carriage devices mounted on the aircraft or in the internal weapons bay. Some examples of this equipment are Air-to-Ground and Air-to-Air Pylons, Alternate Advanced Rail Launchers, many variations of Internal Weapons Bay Adapters and a variety of Aircraft Hardware Support Kits. Working closely with MEC, Marvin Test Solutions currently provides test solutions used in production and depot test of F-35 AME (Figure 5) using the MTS-235. MTS also provides potential warfighting enhancements to F-35 users in the form of an I-level version of the MTS-235 and O-level MTS-3060 test sets ready to support maintenance and sustainment as requirements evolve. Beginning with the delivery of the Hellfire Missile system test set in 1992, MTS has developed and deployed a wide range of test solutions based on the PC / PXI architecture for flightline, backshop, and depot level test applications (Figure 6). From its origins in 1988 to day, the company has grown from its four founders to over 100 strong (Figure 7). As we look to the next 30 years, our focus is still the same - We Make Test EasyTM. The application of MEMS technology has allowed Metal-Oxide (MOX) Gas Sensors to be mass-produced at the wafer level with silicon wafer manufacturing offering cost reduction and scalability to large volumes. These gas sensor devices are suitable for precise measurement of Carbon Monoxide (CO) and a wide range of Volatile Organic Compounds (VOCs) such as Ethanol, Acetone and Toluene. Applications for these sensors, which are largely driven by health and safety considerations, include environmental monitoring, biological research, industrial control, portable breathalyzers and home air monitoring systems. The adoption of MEMS technology for MOX gas sensors has resulted in greatly reduced manufacturing costs. However, each of these sensors must also be tested, which presents a unique set of challenges when compared to the manufacturing and testing of typical semiconductor devices. Working closely with the customer, MTS delivered a creative test solution that provided the required accuracy, accommodated very large site counts, and matched the overall throughput performance of high performance semiconductor test systems at a much lower cost. The specialized requirements associated with the testing of MOX gas sensors presented unique challenges. In particular, the large test “dwell” time required by these devices demanded a different kind of test solution – one that could be easily scaled to support very large parallel test capabilities with test assets that were significantly lower in cost than the traditional “big iron” ATE solution. A PXI-based test system based on off-the-shelf hardware and software provided the optimal solution – achieving both high throughput and very moderate cost. To learn more about how all of the technical requirements were met or exceeded, at a capital cost well under 1/5 of the cost of a conventional large semiconductor test system, download the complete white paper, “Metal-Oxide Gas Sensor Testing”. Precision Guided “smart” Munitions (PGMs) have become the munitions of choice for advanced Air Forces worldwide. Flightline-to-depot support of these complex systems is crucial to ensuring mission success, and legacy test equipment is sub-optimal in terms of supporting the latest generation armament systems. To address the complex test requirements of today’s increasingly sophisticated PGMs, Marvin Test Solutions has developed a suite of products that can enhance armament test capabilities from the flightline to the depot. Many of these test sets are designed to support multiple aircraft platforms and armament systems at multiple maintenance levels, streamlining logistics through commonality, interoperability, and reduced footprint. •	The MTS-3060 SmartCan™ is a battery-operated, handheld test set that supports flightline testing and troubleshooting of AGM-65 systems (including video testing) and also supports “smart” MIL-STD-1760-based weapon systems including Laser-JDAM, AMRAAM, and EP-II. •	The MT1888 Series Laser Source Simulator is an easy-to-use, eye-safe solution for laser guided missile seeker testing. •	The MTS-235A is a rugged, portable tester for F-35 Lightning II Alternate Mission Equipment (AME) that combines the test capabilities of a Depot test set and the compact size of an I-Level test set in a rugged, flightline qualified enclosure. •	The MT3045 Series is an advanced Hellfire Missile Simulator (HMS) for the Hellfire Modular Missile System, capable of simulating Hellfire missiles, tracking critical signals, and displaying status to the operator. •	The MTS-207 is a state-of-the-art portable PXI platform for field testing and data acquisition systems. Its proven architecture has been deployed worldwide on multiple programs including the MTS-206 Maverick Missile system flight line tester, the MTS-209 Common Armament Test Set, the AN/TSM-205 Series Hellfire System test Set, and many more. •	For optically-guided munitions, the MTS-916 Series Modular Target Simulator features state-of-the-art target simulators for TV, CCD, infrared, and laser-guided AGM-65 Maverick and AGM-114 Hellfire and Paveway weapons. The MTS-916 can also replace multiple obsolete AGM-65 target simulators for missile guidance sections. •	The TS-271A is a depot-level Universal Armament Test Set test set for a wide range of armament systems and munitions for the F-16, F-15, and F-18 aircraft. The test includes All Up Round (AUR), subassemblies, and CCAs. •	The TS-201B is a state-of-the-art I-Level and Depot level test set for MIL-STD-1760 and legacy armament systems including launchers and bomb racks. Marvin Test Solutions understands the needs of the warfighters who employ the weapons and provide lifecycle support maintenance. From the flightline to the depot, our range of cost-effective, technologically advanced solutions support complex, mission critical systems. Connect with MTS on social media (LinkedIn, Twitter, and Facebook) to learn more about how We Make Test EasyTM, and visit our YouTube channel to view our latest videos. MTS’ CEO, Stephen T. Sargeant, Major General, U.S. Air Force (Ret.) officiated at a swearing-in ceremony for new military recruits at the Los Angeles Military Entrance Processing Station on August 15, 2018. MTS is proud of these young Americans committing to become soldiers! This year has brought us the opportunity to meet with customers around the globe to demonstrate our customer-focused test solutions for military, aerospace, and manufacturing applications. We truly enjoy this interaction, and we appreciate the chance to discuss your most demanding test challenges. AUTOTESTCON is the world's premier conference that brings together the military & aerospace automatic test industry and government & military acquirers and users to share new technologies, discuss innovative applications, and exhibit products and services. Find us in booth 121. The Air Force Association’s Air, Space & Cyber Conference is the nation's premier event for defense and aerospace professionals from across the United States and abroad. Find us in booth 714. The ADS SHOW 2018 is the major international meeting of Aeronautical and Defence MRO, representative of French excellence, with the spotlight on military operations. We will be co-exhibiting with Sefiam in booth D411. The Logistics Officers Association (LOA) Symposium is the year’s premier event dedicated to enabling interactive exchanges among logistics, acquisition and technology professionals from across the Department of Defense, defense industry and academia. Find us in Booth 200. The ANG Weapons and Tactics Council brings together the Air National Guard and industry leaders to discuss the latest innovations to support ANG requirements. International Test Conference, the cornerstone of TestWeek™ events, is the world’s premier conference dedicated to the electronic test of devices, boards and systems-covering the complete cycle from design verification, test, diagnosis, failure analysis and back to process and design improvement. Visit MTS in booth 508, and be sure to check out our poster session in the exhibit hall. BIAS is a biennial airshow that features exhibits of the latest in aerospace technology as well as flying demonstrations and static aircraft displays, bringing together the global aerospace community. Find us with The Marvin Group in the USA Partnership Pavilion. The AS9100D standard builds on the requirements of ISO 9001:2015 and adds additional requirements unique to the aerospace industry, defining objectives for Quality Management Systems (QMS) including product quality, conformity to customer and regulatory requirements, and risk management. We’re proud to have achieved this certification, demonstrating our continuing commitment to delivering test solutions that meet and exceed our customers’ requirements for quality, performance, and ease of use. Additional information regarding the AS9100D QMS standard is available from SAE International. Marvin Test Solutions’ Quality Policy and ISO 9001:2015/AS9100D certificate of registration are available on our website.